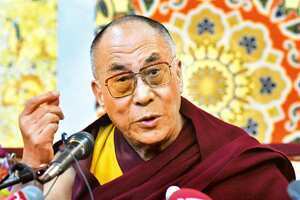 Dharamsala: The Dalai Lama on Sunday ruled out retirement and reaffirmed the support of Tibetan exiles for his “Middle Way" approach to China. The Tibetan spiritual leader said new policy options on China could be considered in the future. The 73-year-old leader told a news conference that he would not retire, putting an end to speculation about his future after he was hospitalized with abdominal pains earlier in the year. “There is no point, or question of retirement," he said. “It is my moral responsibility till my death to work for the Tibetan cause." He said success could also be achieved by pursuing non-violence. The Dalai Lama’s “Middle Way" approach abandoned the dream of an independent Tibet in favour of seeking greater autonomy within China through dialogue. “Total independence is not practical," the Dalai Lama added. “Majority of views have come up supporting the Middle Way path to the Tibetan issue...which is right," he told a meeting of exiles. “My faith is getting thinner in the Chinese government... My trust in Chinese public is strong," the Dalai Lama said. Tibetan exiles said after the meeting they could start more radical protests and demand independence if China doesn’t respond to the “Middle Way". But they did not specify a deadline, saying a time frame would be either made by the Dalai Lama, the Tibetan parliament or the cabinet. The Dalai Lama said the Tibetan nation was close to a “death sentence", and warned Tibetans to unite in their struggle. “In the next 20 years we must be careful in our actions and planning. Otherwise there is great danger to the Tibetan community." He said a crucial meeting of at least 100 international support groups to be held in Delhi later this month could provide a better picture of the way forward.